Blue Robot Books, an Imprint of Wyatt-MacKenz, 9781936214945, 32pp. Monsters get sick too? Yes And, sometimes they need help understanding what makes them feel weird or woozy. This light-hearted approach to biology and healing offers young readers lots of medicinal giggles for a speedy recovery. Colorful A-Z illustrations and simple language explain such things as how casts set bones, fevers flare, and diabetes occurs. Even those who quake at the mere mention of "medicine" will be eager to discover all the zany monsters and their health adventures. 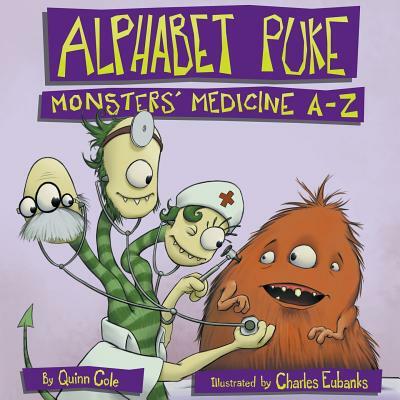 For children 4-8 years of age, ALPHABET PUKE is a perfect find for family, friends, and healthcare providers. Trips, falls, and illness happen, but they don't stop these monster friends from having fun Join them as they experience broken bones, nosebleeds, and even laryngitis, while also learning how things like eardrums and joints work. From beginning to end, these monsters never let sickness slow them down Full of cartoony illustrations that help take the scariness out of illness and medical treatment, this zany book is sure to tickle the funny bone and provide lots of healing giggles. Kid-friendly internet medical resources with puzzles and interactive games offer an added resource in the back of the book.